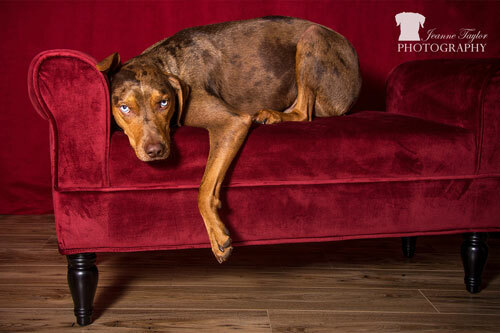 My studio options include warm colors and rich textures and the opportunity to see your pet in a formal setting. It has hosted animals ranging from a chipmunk to cats and kittens, to litters of puppies, to a Giant Schnauzer and several other guests in between! All of my gear is portable so I can bring the studio to you - this works well for pets who may fare better in their own homes. I have found studio time is most effective with pets who are well-behaved (or controllable) and somewhat settled/under good voice command (and a good "sit/stay" is REALLY helpful). I can work around everything else. Click the thumbnail below to visit the sample gallery. If you are interested in discussing a mobile studio session, please contact me. In favorable weather, I do offer a combined indoor/outdoor session where pets are photographed in the studio and then we take some time outdoors as well.